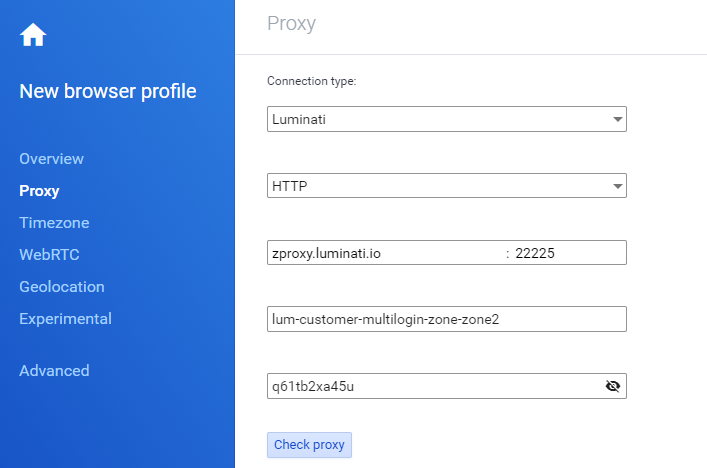 This page explains how to setup Multilogin with Luminati Proxy solution. Read more about Luminati on our blog here. Before setting up Luminati proxy with Multilogin, you first need to setup zones in your Luminati dashboard. A zone is a set of preferences of what type of proxies you are planning to use. Set the zone's preferences: Proxy type (Data center, Mobile or Residential); Targeting permissions (ASN, City, Country) and your Luminati price plan. Add your IP address to the whitelist IPs. Note, if you will need access from multiple computers or have a dynamic IP address, you can just add „any“ in the field. Once you have created the zones, you now have the option to either user Luminati Super proxy or Proxy manager solutions. Select the proxy's pre-set configuration. Long single session is recommended if you want to maintain the same IP for as long as possible. Another way you can use Multilogin with Luminati is by utilizing a Super proxy. In general terms, a Super proxy is an entry node, through which you connect to Luminati servers. Once you are connected, the service will redirect all your traffic through an exit node of your choice. In compassion to the Proxy manager, you do not need to install a additional software on your PC to connect to the proxies. However, it comes with a cost of being able to control IP releases only to a certain extent. In the proxy name section insert your Username (the one you got when you were setting up the zone) along with location prefixes (discussed further). In order to have an IP address located in a specific country or city, you will need to specify that in the Username of your super proxy by adding a prefix. The 39484 value is used just as an example. It is recommended to set different rand prefix value for each browser profile. You can set a random number for rand prefix. Please notice that glob_ prefix is not working correctly with Multilogin. To increase performance you can use a super proxy close to your location by using the full name of the server in the Proxy Host. For example, if you are located in the US, you can use this proxy host to increase connection speed: servercountry-us.zproxy.luminati.io (see additional options for obtaining super proxies or contact Luminati support).